As of October 2017, nearly two years into Eddie Jones’ reign at Twickenham, England don’t have an attack coach. England have a dedicated defence coach Paul Gustard, forwards coach Steve Borthwick, scrum coach Neal Hatley, a key man Dean Benton as strength and conditioning coach and consultants such as Jonny Wilkinson and the sensational Will Greenwood. Jason Ryles of the Melbourne Storm has come in as a guest defence coach, and we even have an eye-training specialist in Sherylle Calder, who was part of both the 2003 and 2007 WC wins. Yet for all the people brought in, one role remains glaringly vacant: that of attack coach. Glen Ella has been brought into the England set-up on more than one occasion to assist Jones, but the RFU don’t want an Australian attack coach, they want an Englishman. Ali Hepher of the Exeter Chiefs is being considered by them, but not by Jones. Ella loves coaching England. We saw his reactions to England’s victories in 2016 against Australia and Argentina in 2017. His enthusiasm at England snatching games from the fire was as passionate and excited as any Englishman I know, and he wants to take the role. He’s hugely experienced and knows exactly what skill-sets Jones values. He’s the closest we could get to a Wayne Smith – a Professor of our own who would be invaluable in England’s think tank. Yet we don’t have him. So, Jones coaches the attack himself, not trusting anyone else bar his childhood friend to take the reins. The England attack is unique. It doesn’t follow any standard system of attack used by other international teams. It doesn’t follow a 1-3-3-1 or a 2-4-2. It’s largely derived from the Japanese game plan, with many similar patterns of play to Japan under Jones. However, a key is greater emphasis being placed on power and physicality due to the player size we’re able to select. This game is geared towards utilising the distribution skills of both George Ford and Owen Farrell, with particular emphasis on the backline’s alignment off Ford and flat passes on the gain line to the forwards. 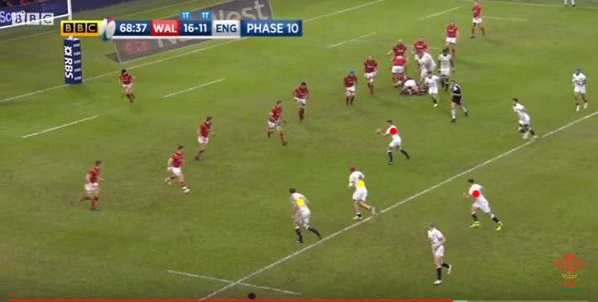 This deception is paired with extreme physicality from the England pack, and the fitness of England’s forwards. Philosophically, I believe Jones is bringing the Rod MacQueen Brumbies pattern that worked so well in the 90s. Back to the future. He’s modernised it, that’s for sure. 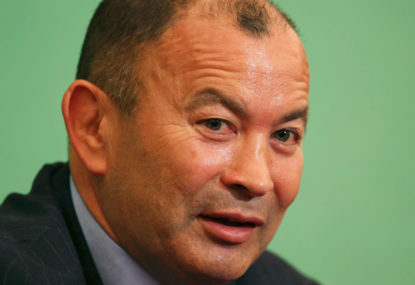 But England’s hit-and-run rugby, plus Jones’ exclusive use of Ella, leads me to believe he doesn’t want anyone else coaching it, as no one else understands it in detail. England don’t try to go around teams. 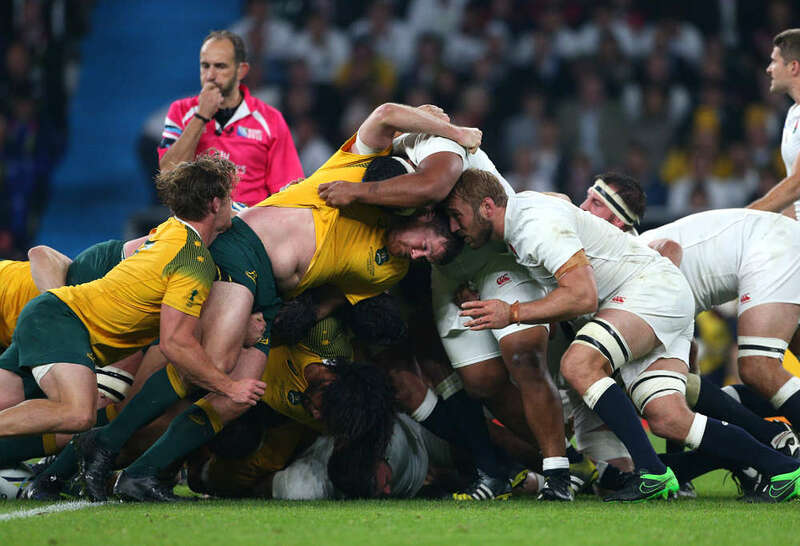 They have the players to do it, but English Rugby is and always was meant to be physical, uncompromising and hard-hitting. We have fast wingers who can utilise space, and we have the patterns to do so. However, we also have the forwards to go through teams. The likes of Billy Vunipola, Nathan Hughes, Maro Itoje, Courtney Lawes, Jamie George, Tommy Taylor, Kyle Sinckler and Ellis Genge are key to this. Not only are all of these players extremely powerful, they’re also very fast. Half of those mentioned are arguably players that are on the bench and can be brought on against tiring legs. Hence, we want to use them in a specific type of way. It’s a point of difference and one advantage we have against many other teams in international rugby. However, Jones has also picked very mobile forwards. This is highlighted in the locks, with Itoje, George Kruis and Courtney Lawes being some of the most physical, yet mobile forwards in the northern hemisphere. This is key. While England have their patterns, it demands a high level of fitness from the forwards to switch between them. England alternate their patterns. Most of the time, there’s a forward out on either wing like in a 1-3-3-1 but England performs it more along the lines of a 1-2-2-1, which I have christened the ‘two-prong’ pattern. Usually, it’ll be Itoje and Jamie George due to their speed. There are also two two-man pods (or prongs) split near the 20-metre lines or, on one side of the field, depending on how the backline is aligned. As for the last two forwards, they’re nomadic. Not only do they provide extra support for the ruck if needed, they can operate in support of the 9 or 10. You often see them coming in as inside runners off the fly-half. This is a structural pattern – it happens too often not to be. Alternatively, they move around from the blind to open, offering themselves as hard runners on the fringe of the ruck. This 1-2-2-1 pattern, however, whilst the default, is not always used. Sometimes, all forwards move to one side of the pitch to secure the ball and play tight. This leaves only backline players on three-quarters of the pitch. 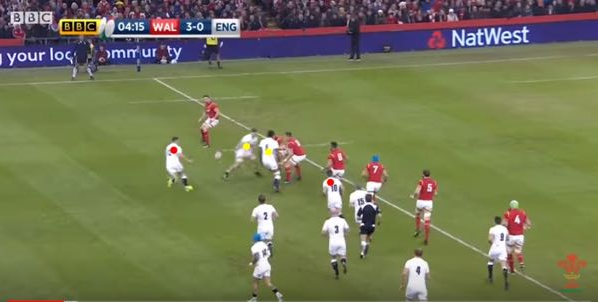 Other times, there have been instances of 2-2-2-2, which could be Eddie Jones adapting to the new ruck laws, which allow far more leniency to the attacking side. That’s why this pattern is currently so unique. 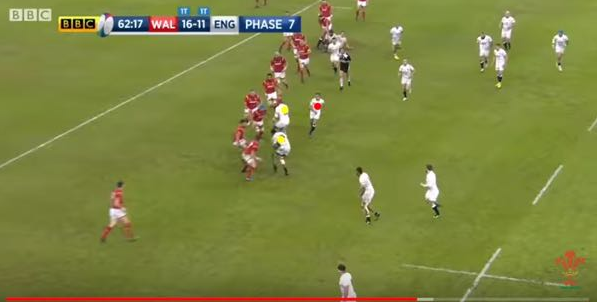 England forwards, aside from the two prongs, seem to have great autonomy in their phase play. As such, they have to be fit. 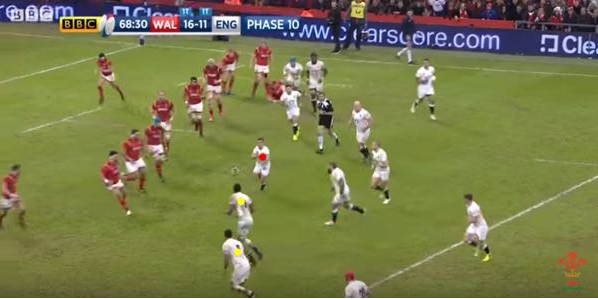 In the example below, we can see Ben Youngs passing to the first prong. The first prong’s job is to hold the line-speed out wide, prior to the next phase. Launchbury and Itoje are running hard onto the ball, working as a unit to drive over the gain line. 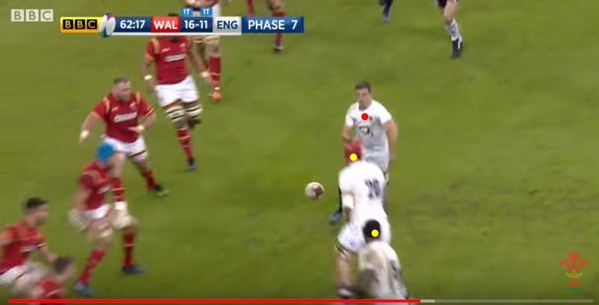 George Ford is running behind them as a decoy receiver, which keeps the defence on the outside wary. Even more so, though you can’t see it, Haskell and Lawes are moving forward into a flatter position as well, keeping the defence interested. This is important, as they’re trying to present multiple options. This is the second prong at work. The first has taken the ball into contact, the ruck cleared out by the nomads, and Ford has jumped in as first receiver. His sole job is to pass to Lawes, a powerful runner in his own right. Ford stepping in as first receiver is important. This allows the second prong to stand a greater distance away than it would do if it was run off the 9. The second prong follows the first in terms of their attack, running onto the ball, working as a unit to get over the advantage line, ruck and retain the ball. However, the objective is different. The second prong generally cuts an inside line. This is because they hit the line wider. Therefore, it’s able to fulfill its main target point at the edge of the defensive line, as seen below. Ford allows the ball to be stretched out quicker. It also stops the defensive fulcrum rushing up on them. With Ford, we’re working towards the blindside with quick ball and therefore cutting out defenders with long passes. This allows England to spread across the field faster than defenders can number up. What we see here is the result of the prior phases. The ball has moved across the field quickly and the forwards have been able to provide quick ball. Youngs has fired a long, flat pass to Ford. The men outside him keep their width and flatness off the 10 and Ford himself is stood flat at the line. Look closely, this allows him to hold the inside shoulder of Cuthbert. Brown runs a hard inside line off Ford, which holds part of the inside defence, not allowing them to drift across. Again, this is the effect of multiple options. Ford takes the ball flat to the line, giving the pass to Jamie George, the 1 in the 1-2-2-1 system. With the space created on the inside by the two-prong combo, quick ball and flat alignment, George makes inroads halfway into the 22. This wasn’t done with any fancy decoy moves or offloading in the tackle to generate space. This was done with three phases across the pitch, accurate distribution, quick ball and good lines by multiple players offering themselves as an option. Again, this attests to the fitness of England’s forwards and the effect of good basics – something all coaches can learn from. The objective of the shape is to constrict the defence between the two 20-metre channels. It also cuts down line-speed of the defence, allowing England space and time to use their wide men. This isn’t simply a one-way pattern. 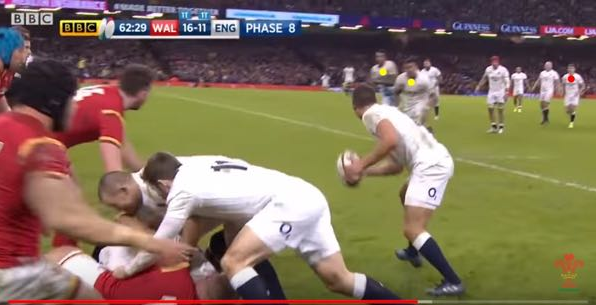 If the ball is taken into contact by the second prong and there’s no space out wide, Ford can reverse the direction of play, targeting the first prong of Launchbury and Itoje from the prior phase. However, as shown below, it’s not always designed to constrict the opposition in the middle of the field but on one side as well. This ruck is the result of the Jamie George inroad. One prong is already running hard approximately five metres from the ruck. Out wide you can see Owen Farrell, in the absence of Ford, organising the next prong. They have stressed the defence so much that they haven’t contested their ruck ball, even with only England backs in the ruck. As such, the defence is still realigning as the prong charges in. One phase later, Haskell and Marler are the second prong and Owen Farrell is preparing a wide play. In this case, the wide play is on as there are players out on the wing (out of shot). However, better decisions could be made. England have slipped into a 2-2-2-1. The first prong has just hit in the prior phase and there are two other prongs set up. Haskell and Marler form one, Cole and Launchbury the other. Youngs has passed directly to Haskell when he shouldn’t have. The first receiver on this phase should’ve been Owen Farrell using Haskell or Marler as decoy runners. 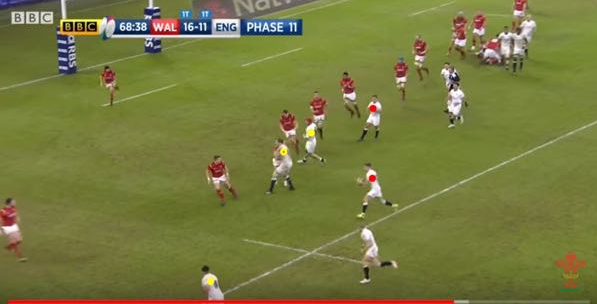 He could, with his distribution, take the ball to the line, allowing time for Launchbury and Cole, as the second prong, to take the ball flat. This is because Launchbury and Coles are far closer to the edge of the defensive line and therefore hold the drift. 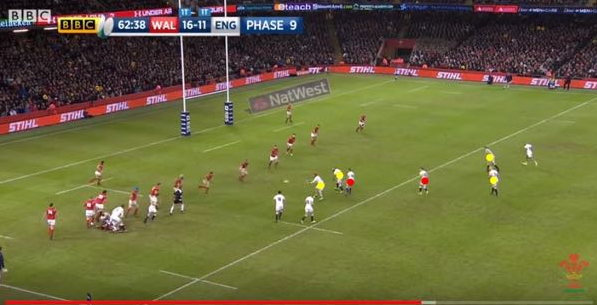 If this prong finds contact and England generate quick ball, the defence hasn’t had time to number up out wide. It’s a standard pass to the blind and they’re already past the umbrella defensive fulcrum on the flank. Out of shot, there are also three rapid players in Joseph, Nowell and Itoje. These three are looking at an empty wing and could create a three-on-one situation. Instead, Haskell takes the ball into contact and they attempt to go wide. Due to the contact being far from the edge of the defensive line and the second prong of Marler and Haskell not getting much gain line advantage, the Welsh have more time to rush up and cut off the wing. This is an example of trying to constrict the defence on one side but it wasn’t as effective as other occasions. The designed targeting of the edge of the line is better shown in the following example. Here, we have a similar situation. Brown is on the inside of the first prong, running hard straight lines to hold the line speed. The prong goes into contact, Youngs manages to get quick ball and fires a pass off to George Ford (red), who’s standing very flat. This occupies the defence and stops them from drifting. As another option, you see Brown on his inside shoulder. Ford fires his miss-pass very late and hits Clifford in the second prong (yellow). Clifford, with Lawes, is running hard, targeting the edge of the defensive line and preventing the line rushing up. You can see Farrell (red) behind Clifford – outside him are two of England’s fast men in Joseph and Daly. The pass finding Clifford here is essential and a testament to the passing skills needed for this to work. Clifford can offer up Lawes as an inside option and the one thing that checks a defence drift better than a screen pass is an inside ball. He shapes to make an inside pass to hold the defence, instead looping a pass to Farrell. 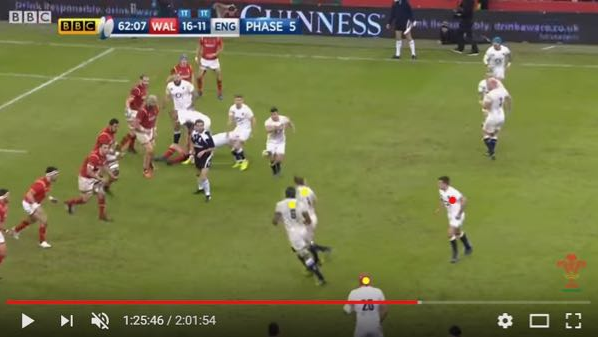 With the pass made so late, Clifford and Lawes can subtly act as blockers for the drift defence. This leaves Farrell, who then has two fast men on his outside and one man to draw. Unfortunately, his pass is not a good one and stymies the momentum. If it goes to hand cleanly, Joseph/Farrell can draw Cuthbert, leaving Daly on his wing. It’s a run-in try as the second prong usually commits the sweeper behind due to the hard running nature of it. As can be seen here, we have the same basic pattern. The ball goes to the first prong who go into contact. See the nomads on the inside who are running to try and form the ruck. Quick ball is generated and Youngs fires the ball out to Ford. Ford steps in as the first receiver, whilst the second prong, again, targets the edge of the defensive line. You can see Cuthbert charging up in anticipation. Ford fires the pass to Farrell who then finds Jamie George, again the one-pod in the system. George takes the ball from the 22 to the five-metre line. This is all created by the work of the inside men. This includes Launchbury who’s making an obstacle of himself for the drift. Simple rugby, performed to a high level. This pattern isn’t always performed this way. Either prong can act as a screen or one can run a loop play to go wide-wide. Sometimes the forwards within a prong will do an interplay and act as first receiver. There are many variations but this structure is one that England use often and is quite prevalent in their multiple phase play.